Netanyahu, VP Wang chair the fourth meeting of the Israel-China Joint Committee on Innovation Cooperation at the foreign ministry. Prime Minister Benjamin Netanyahu and Chinese Vice President Wang Qishan, today, Wednesday, at the Foreign Ministry in Jerusalem, chaired the fourth meeting of the Israel-China Joint Committee on Innovation Cooperation. Before the meeting, the two men toured the innovation exhibit at which five Israeli companies presented their inventions in the fields of agriculture, medicine, smart transportation, advanced vision technology and artificial intelligence. Prime Minister Netanyahu and Chinese Vice President Wang chaired the fourth meeting of the Israel-China Joint Committee on Innovation Cooperation in the framework of an intra-government (G2G) meeting in which members of the Chinese delegation – including ministers and deputy ministers from 13 ministries – also took part. The Prime Minister and the Chinese Vice President were briefed by the ministries involved in advancing cooperation. Eight joint agreements were signed in the fields of science and technology, the life sciences, innovation, digital health and agriculture. The innovation conference 2018-2021 action plan was also signed. 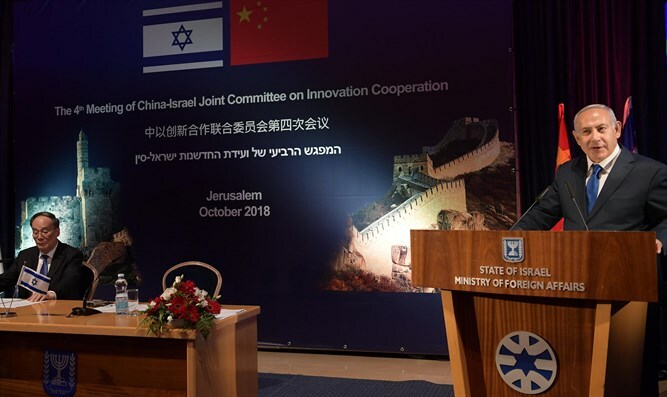 The innovation committee meets annually alternatively in Jerusalem and Beijing and – inter alia – advances cooperation between government officials from Israel and China, joint projects involving the private sector, joint research in science and industry, and grants scholarships for Israeli and Chinese students. Chinese Vice President Wang arrived in Israel with a delegation of ministers and deputy ministers for an official visit at the invitation of Prime Minister Netanyahu. "China is the second largest economy in the world, growing rapidly. Israel is among the leading innovation nations in the world. It's a global technological power. The sustained growth of both our countries and both our economies requires two things, which the Vice President spoke about just an hour ago. It requires innovation and it requires scale. It's the combination of the two that gives you the greatest effect and the greatest effectiveness. The combination of Israeli technology and innovation with Chinese industry, expertise, innovation and markets is very powerful. I believe that we can get more from trade and from free-trade because free-trade between us would accelerate joint ventures, would accelerate the recognition of mutual expertise by Israeli companies and their Chinese market partners. That's quite separate but also added to the benefits of direct joint ventures which we welcome and I think are happening anyway. I believe our cooperation has no limits. It extends to the fields of science, entrepreneurship, cultural exchanges, research and more. Chinese companies are already opening R&D centers throughout Israel, joining hundreds of other international companies choosing Israel as their innovation hub. And Chinese companies are also involved in dozens of strategic infrastructure projects in Israel. We discussed this at some length just now in our meeting. There is a natural partnership between us. We want to expand it for the benefit of both our peoples. We want to expand it for the benefit of all of humanity and I think the opportunities are vast. So I can only say that I welcome the opportunity to have these discussions with the Vice President as I welcomed the opportunity to have these discussions in my recent visit to China with President Xi Jinping and I think we should continue this discussion as you suggested."